Latest Design Option 7, Photo 1 » Roger Perron Inc. 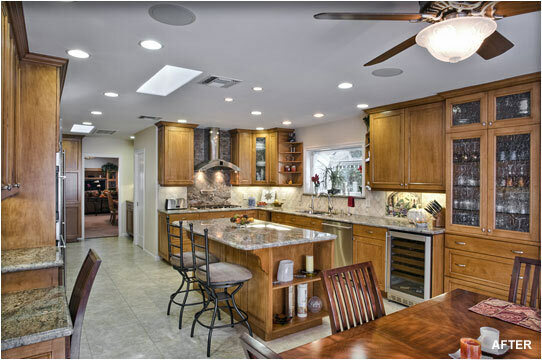 This addition and kitchen remodel provides owners with ample space for storage and meal preparation as well as a great place at the breakfast table to enjoy the yard, family and friends. The unique cabinet stain and granite combination satisfies the owners’ tastes and is beautiful, while the design layout has appointments that contribute to happy homeowner feelings. Design for this addition and home remodel in Tarzana was created by Roger Perron, design-build general contractor, with contributing architect for working drawings Curt Sturgill.